Today’s post for Day 355 of the VM_365 project features a series of images behind the scenes at our Friendships and Fallouts, Waterloo to World War One TimeTunnel, which has featured in the last four days of VM_365. Day 351 took you through the first stage of the Tunnel, exploring Britain at the time of Waterloo, Day 352 took us to the Victorian period and the Crimean War. The industrial era and the age of Inventions in the 19th century featured on Day 353 and we entered World War One on Day 354. 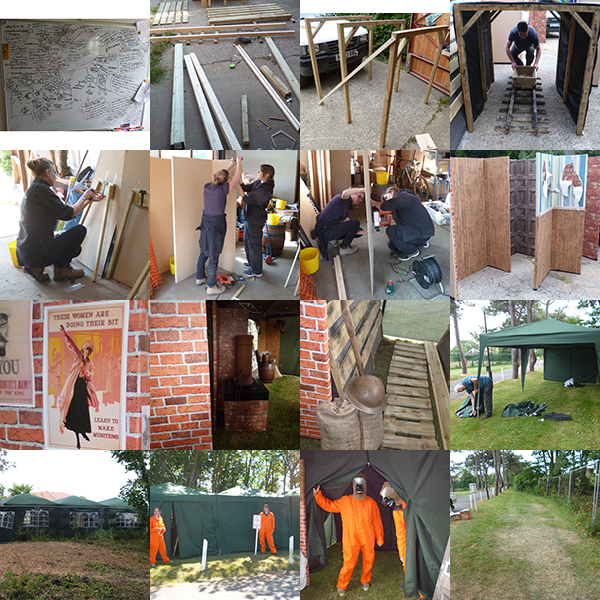 Today’s picture shows how we built the flats that featured in the Time Tunnel and some of the scenes along the way, as well as some of the lighter moments of setting up and running the Time Tunnel experience. Once again we had great fun at Bradstow School and we hope that we gave an interesting and educational experience to our travellers through time. Today’s image for Day 349 of the VM_365 project was taken as the Trust set up a Virtual Museum TimeTunnel, ready for four days of workshops for schools to be hosted at Bradstow School in Broadstairs from the 15th to the 18th of June 2015. 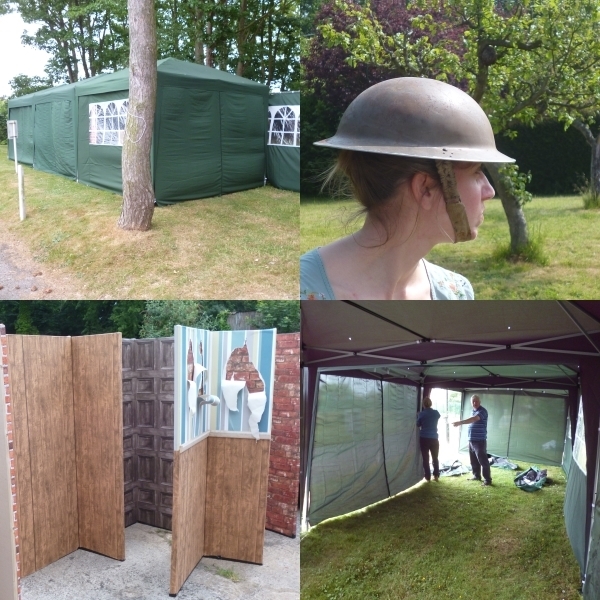 The Heritage Lottery funded event ‘Friendships and Fallouts, from Waterloo to World War One’ will see as many as 500 children pass through the workshops and activities in the grounds of the school. The event commemorates both the bicentenery of the battle of Waterloo and the continued marking of the hundredth anniversary of the First World War. The TimeTunnel will take children on a journey through the changes that took place in British life in the hundred years from the defeat of Napoleon to the outbreak of a conflict that reached every part of the world. The TimeTunnel visits a series of scenes that explore the changes from industrialisation to the great inventions of the early 20th century which created the means to make global conflict possible. As the journey through the tunnel takes place, the friendships between nations, families, working people and soldiers are investigated and the fallouts that provoked conflict between people and nations are revealed. The journey through the TimeTunnel ends in the battlefields of the Western Front with the fate of all the travellers left undecided. Journal articles over the next four days will reveal the secrets of the VM TimeTunnel and follow the progress of the event. 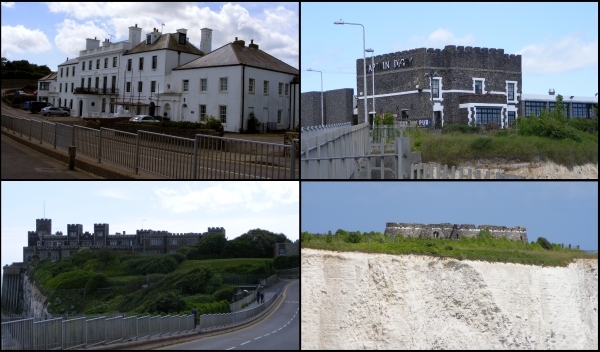 Today’s image is another in the Our Thanet series of posts. 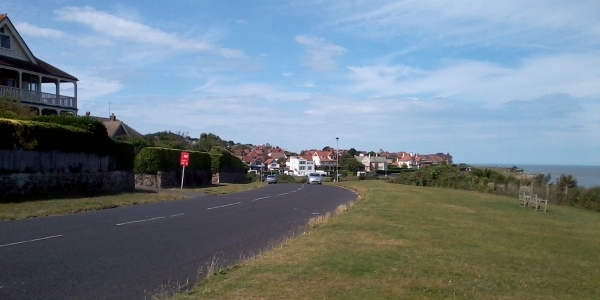 This time it is a view of the coastline from Dumpton on the left side to Viking Bay at Broadstairs on the right. This part of Thanet’s coast is also subject to heavy erosion, which has formed a distinctive wave cut platform which can be seen in the foreground and the high chalk cliffs that can be seen in the centre of the picture. Like the other coastal areas shown in our two previous days posts, this landscape would not have been recognisable to the prehistoric inhabitants of Thanet, who may have lived and died on rolling downland slopes that have been cut away by the sea. Their coastlines were much nearer to the vantage point on the edge of the platform where the picture was taken, but were always advancing toward the high central chalk ridge of the isle. If they were somehow able to return, even the later Iron Age people and the Roman settlers of the area would have trouble placing themselves, their settlements and their buildings which are known to exist at Dumpton on the far left and on the promontory next to Fort House on the extreme right. Much of the archaeological evidence of past occupation in the landscape between has been lost to the cliff falls that occur regularly following storms at sea and we will now never be able to piece together the whole story of early settlement along the coastline that is shown in today’s image, which makes the knowledge we have gained from previous excavations, many of which were carried out by pioneering archaeologists like Howard Hurd and Dave Perkins and have featured in earlier posts, so much more significant. Today’s image for Day 333 of the VM_365 project shows a series of views of surviving agricultural buildings in the now hidden hamlet of Upton which is located on the eastern side of Broadstairs. The main focus of the former hamlet is located around the junction of Fair Street and Vale Road. 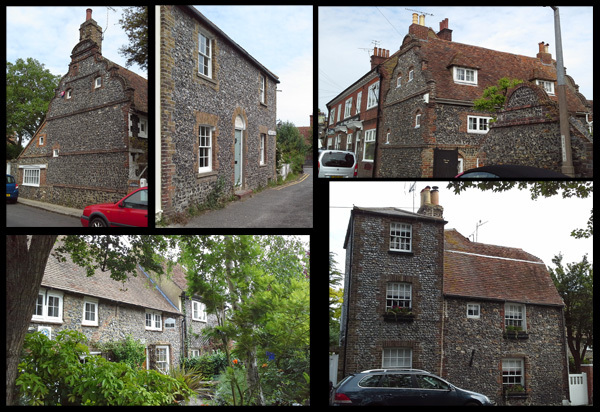 This picturesque corner of Broadstairs contains a number of buildings and features reflecting its rural past that are easily visible from the road. 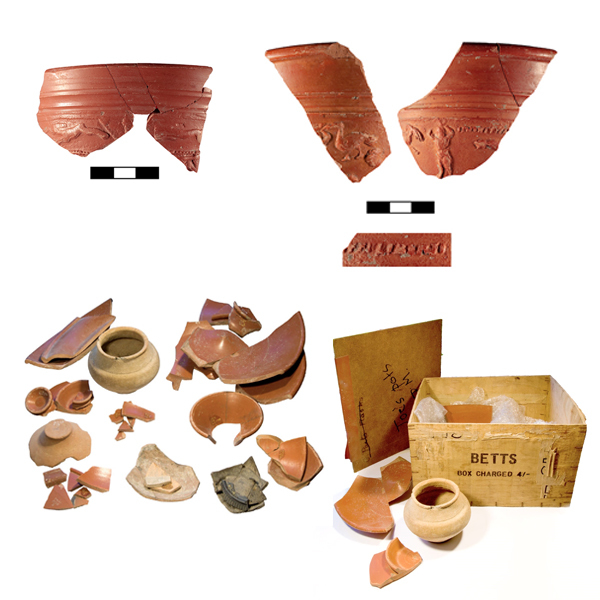 The oldest surviving building is Little Upton, shown in the top left of the image. This Dutch gabled house was constructed in the late 17th century in two sections with different roof levels and is located on the northern side of Vale Road. On the opposite side of Vale Road you can see the remnants of Upton Farm which incorporates an Oast House, (bottom left) probably originally constructed in the 18th century as a timber framed single storey barn. The pyramidal slate cap on the left side is a mid 19th century construction. If you look at the brick gable end that faces on to the footpath you can see where the roof has been raised probably in the 19th century. Other buildings hinting at the area’s rural past can be seen along Vale Road (top right) where long, narrow flint built buildings are located side on to the street aligned along the edge of the former farmyard. 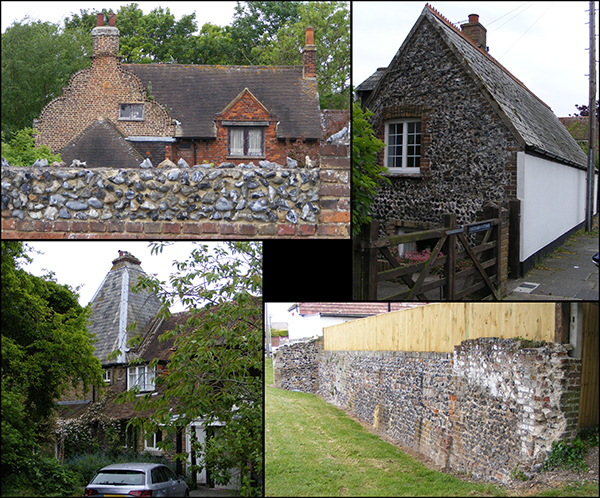 Near the junction of Fair Street is a long brick and flint wall forming the boundary to a cottage. This wall has many phases in its construction and once formed part of an agricultural building or barn that has since been demolished. There are lots of other elements visible in the street scape around Upton that hint at its rural past which can be easily identified if we take the trouble to really look. Today’s image for Day 325 of the VM_365 project shows the parish church of St Peter the Apostle which is located in the vilage of St Peter’s, Broadstairs. Like the parish church of St John the Baptist, Margate which featured on Day 324 of the VM_365 project, this was originally a chapel to the mother church at Minster before becoming a parish church in its own right in the 13th century. This church was constructed in the 12th century and was originally much smaller consisting of a chancel, nave and a south aisle with at least two bays. The original Norman arcade of mid 12th century date still survives. The church was extended with the addition of a north and south aisle in the late 12th century. The existing north chancel arcade may be of early 13th century date. In the 14th century the Norman aisles were widened and the north west tower with its crenellations and gargoyles was added in the early 15th century. Interestingly the church tower was used as a signalling station in Napoleonic times due to its then highly visible location and it still has the right to fly the White Ensign. 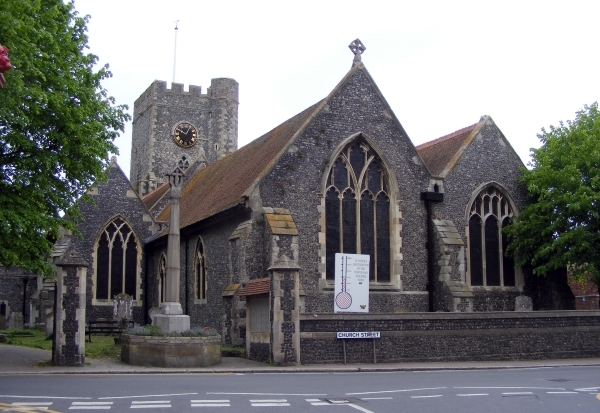 Like our other parish churches on Thanet, this church was heavily restored in the mid 19th century.